Ambassador Johnson Agara OLWA and Embassy Staff meet the Mr Alexander Kopkov, Director International Cooperation Department of the Chamber of Commerce of the Russian Federation with his delegation at their offices this afternoon. The Ugangan delegation will comprise of both Government Officials and Business Representatives . The purpose of the Intergovernmental Commission is to strengthen the relations between the two countries that have existed since 1962. The Uganda NationChamber of Commerce and Industry signed an a memorandum of understanding in 2009 . 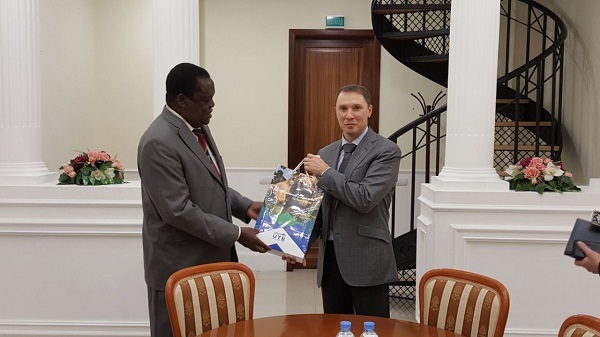 Uganda is promoting trade , investment and tourism between the two countries and as called upon the Russian Business Community to consider investing in the tourism sector as well as visit Uganda as a tourist destination. Agriculture, mining , infrastructure development are some of the other sectors Uganda is inviting Russian Investors to consider .